You are currently browsing the category archive for the ‘Mark Baker’ category. I can remember very academic arguments with David Anderson way back when as we each sought to determine for the next twenty years, how property rights should be divided up ethically and morally…. One view is that libertarianism should be the rule. Do what you want as long as no one gets hurt. The other view was that society should rule. We are getting hurt so we now have to dictate what you can do…. People should be allowed to do what they wish as long as others are not hurt, When others feel hurt, there needs to be an arbiter or judge who looks at both sides before siding against the property owner. I think that makes sense…. In the town of West, Texas a fertilizer plant exploded across the street from a school, one block away from a nursing home, and two blocks from an emergency services building. This is what zoning is in place to prevent. It also prevents too much runoff, to much commercialization, too much traffic, too much sewage, too many stoplights, too much congestion, and too much time out of our lives. And when things go horribly wrong, like a corporate entity like Christian Hudson or Mark Baker, cuts a corner or two like a fertilizer plant did in West, Texas…. BOOM! We’re all dead. Some of you have lived in Delaware more than ten years… You fondly remember the excitement building up in your car as you raced through the forests that lay between Lewes and Rehoboth. Good zoning could have left them an still created the business that provides the tax base now. But good zoning was cast aside for misplaced words like “freedom” and “liberty” and “property rights” …. Those have there place, but not in zoning situations. There at least, some type of thought process should ahve played a part, instead of knee-jerking when either Christian or Mark jerked the chain. You probably don’t need good zoning in the tundra of Alaska or the Yukon. But you do need it in Delaware. It is time to start shouting down the nincompoops in Sussex County who have only a three word vocabulary when the show up at County meetings: liberty, freedom, and property rights…. The rest of us have rights too, and we are far greater in number than those three people who created the logjam that begins south of Federal Route 9. Then Just Like That, Boom, It Went From White To Brown…. I’m tying together three threads to make a knot..
A. The election 2012 showed the end of political dominance by “white people” on the national stage. B. John Stapleford wrote a derogatory piece in Wilmington’s News Journal whining that “blacks and browns” (his words) were lazy, no good, bums and would always not vote for a white guy, no matter how fly…..
C. Martin Luther King Blvd. is renamed off of Duke of York Streets, William Penn Street, and Court Street…. This 2012 election bamboozled Republican strategists because they totally neglected to account for the votes of Blacks, Hispanics, Asians, who were heavily engaged in this election. To Republicans, these people never mattered. But, these people who never mattered, now have more votes. They, are the majority… and far more moral than any Republican Moral Majority could ever hope to be…..
John Stapleford’s piece was an attempt to denigrate this very vote. By saying thugs had overrun the election, he could still attempt to keep his values above water. He was trying to say….”our outdated values are still the true path; we were overwhelmed by critters and just lost one round, that’s all.” It didn’t fly. His audience almost to every man and woman, saw it as prejudice and nothing else. Instead, the die had been cast. This Obama was the direction America really wanted to go…. Dover changed the name. Now Dover is the 40th Capital City to have a Martin Luther King Boulevard. It will not be the last…. In a sad way, Delaware’s Colonial Heritage is being lost to the 20th Century… The Duke of York put Dover in the same class as Williamsburg. The colonial aspect of Dover is now gone. It is just old buildings on a street that happens to be named after the bravest American of the last century… Before there was correlation…. Now, what’s the correlation? But that is … as it should be… Times change. And really… though sad to see 300 years of tradition swept away, exactly “who” is the Duke of York? How many of those voting in Dover itself, could have answered that question properly? He, along with William Penn… have no meaning to people whose ancestors were sold, brought across the Atlantic, sold again, mistreated, and then once freed, quietly kept in second class status, until one man made so much noise it could be ignored no longer….. It is proper and fitting that someone who has more name recognition and who deserves to be honored, replaces 300 years of tradition… We can only hope he may reign on that street sign, as long as did the Duke of York….. The vote has passed. We are now in a new America, and it is good. I know that is not how the comment was intended…. but that is how it came out…. With Sandy’s approach, words of warning went out to all campaigns.. Get your big signs down for the storm. Feel free to put them up after the storm blows by. Everyone got an email. There were no libertarian candidate’s signs. As dedicated citizens, the libertarian team scoured the county and by noon, their signs were all stored for save keeping. The one Jill Stein sign I’d seen, was gone. Secured by the Green Party…. In fact the only signs up as darkness approached, were those of Alex Pires, which is understandable, it being a one man operation, and those of the Republican line up, which apparently has even fewer supporters. It looks like Kansas, at intersections now, with only Republicans contesting a one man operation…. If the Green Party and Libertarian party can mobilize faster than the Republican, it is time to stop calling the Republican Party a “major” party. Even the Wizard of Oz had more going for it than today’s Delaware Republicans, who with their daily bumbles are rapidly creating a new definition of the English word pathetic. 1) There is no universal healthcare. 3) Low Flat Tax System. 5) A deep reverence for God. 6) Extremely strict rules against abortion. 7) Marriage has already been strictly defined as between man and woman. 8) Homosexuality is a sin, and illegal. 9) Dress Codes are strictly enforced. 10) Tattoos, piercings, baggy pants, are banned. 11) Has the Death Penalty which they aren’t shy about using. 12) Strong private school system with religious focus. 13) Widespread dependency on oil and natural gas drilling. 16) Culture that promotes family and stereotyped roles for men and women. I’ve endeavored to put all your values on one page. I share your frustration because today, ever since 2008, it seems like America is moving further and further away from these values. But you don’t have to be frustrated anymore. I have looked far and wide and have discovered a place already in existence that has those values in place, and more. If you sorely long for those values above, it is sincerely a place where you and your family would be very happy. You don’t have to pay me. I don’t need any commission. Just glad to help a fellow Delawarean out…. No problem. Would any American support a law imposed on us by the Soviet Union? Would any American support a law imposed on us by Communist China? Would any American support a law imposed on us by Islamic Iran? Would any American support a law imposed on us by Mexico? Would any American support a law imposed on us by Canada? Would any New Yorker support a law imposed on them by South Carolina? Would any South Carolinian support a law imposed on them by New York? Would any Delawarean support a law imposed on them by Alaska? It’s the law… of what? It’s the law of…. who? It’s the law decided by whom?…… What reference does this law have to me? Such is every Americans feeling to corporate law… These laws were applied to the lawbooks without our knowledge. These laws were applied to the lawbooks without our approval… There laws were applied to the lawbooks not in an open environment, but subtlely sneaked in, unannounced, unnoticed, unapproved, unsubstantiated, and unconstitutional….. These laws that are being upheld, benefit a very thin percentage of people, a razor thin percentage of people. at the expense of the majority….. Yes, we will follow a rule of law onto which a majority of us signs on to… But nowhere in our contract with America did we agree to follow laws that have not been sanctioned by the Constitution as being legal. Nowhere in our contract with America, did we agree to follow the phantom that corporations were human beings. that corporations had just as much right as people to write laws, get them passed, and then uphold them… as if they were people…. If you don’t believe me, just ask Jesus. It is funny how so much time and effort is spent determining who will run on the Republican side of the Presidential race, when that whole contest is made meaningless by this one chart…..
Republicans don’t want you to see this chart. Democrats simply lack the capacity to understand what it means….. The standard Republican argument against this: “That is bunk. 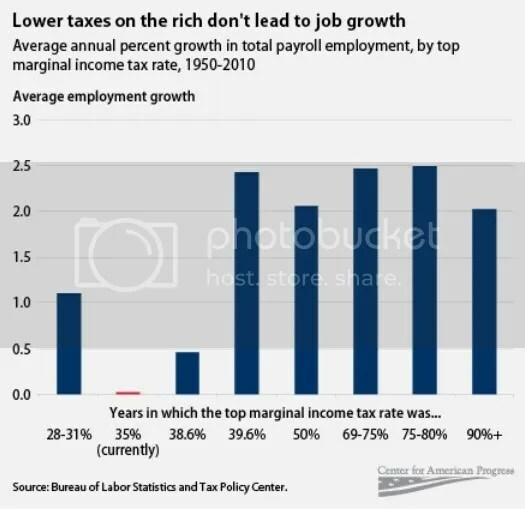 Everyone knows cutting taxes grows jobs….” (end of argument). What never gets done, except in the bottom comment sections of well meaning blogs, is the proper rebuttal…. If that is bunk, explain how and why history itself proves it otherwise? And alas, they cannot answer that, because they are wrong… Low taxes do not create jobs. Higher taxes do…. Of Course Mother Nature Hates Republicans! Many of the areas hit by the storm had also been hit by Irene. In New Jersey’s Hamilton Township, Tom Jacobsen also recalled heavy spring flooding and a particularly heavy winter before that. “I’m starting to think we really ticked off Mother Nature somehow, because we’ve been getting spanked by her for about a year now,” he said while grabbing some coffee at a convenience store…..
OF COURSE YOU DID, DUMMY. YOU VOTED FOR REPUBLICANS!